New to Paws and Play? See our special offers! Over 4,000 square feet of indoor / outdoor play areas. Access to a variety of activities, as well as pampering services. Security measures including smoke and fire protection, advanced security system, 24 hour camera surveillance, and a back-up generator. 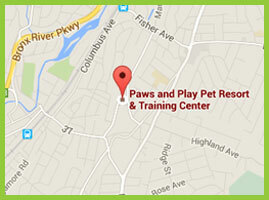 Our goal at Paws and Play is to create an environment where each pet feels at home with our family. We accomplish this by treating each dog as if they were our own with tons of one-on-one attention! We are not your traditional kennel or boarding facility; we pride ourselves on being a premium pet resort! You don’t have to worry about leaving your dog alone with a stranger when you book a dog boarding reservation at Paws and Play Pet Resort in Tuckahoe. We treat your dog like one of our own! 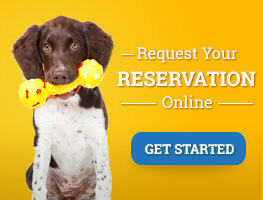 Call us to customize your dogs stay with us to include a variety of fun activities. Our dog daycare program at Paws and Play Pet Resort provides the type of enrichment and fun that every dog needs. Our professional staff ensures that your pet receives just the right amount of exercise and socialization for your dogs breed and temperament. A trained dog is a happy and healthy dog. Let our professional dog trainers at Paws and Play Pet Resort & Training Center help you develop a great relationship with your pet. From puppy socialization to teaching an old dog new tricks, we’re here to help you. Whether your dog needs a full bath with shampoo and conditioner or just a trim, our professional dog groomers at Paws and Play Pet Resort get the job done. Give us a call to schedule an appointment. 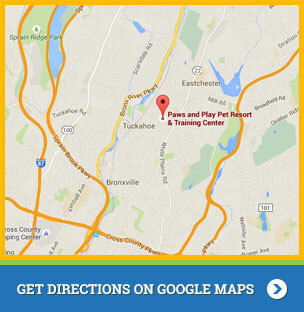 Convenient to all of Westchester County and surrounding area.